Aquacultural fishpond technology allowed the ancient Hawaiians to move beyond mere harvesting of fish and other marine products (i.e. crustaceans, shellfish, and seaweed) to intensive fish production and husbandry. Reportedly, a total of 449 ponds that were constructed prior to A.D. 1830, most during the prehistoric period. They were built on all the major islands. Broad shallow reef flats or natural embayments provided an environment where ponds could be constructed easily in sweeping semicircular arcs out from the shoreline. Along the shoreline were ponds with (kuapa, or pa) and sluice gates (mākāhā). The distinctive feature of the kuapa ponds was the sluice gates. The mākāhā was stationary with no moveable parts. This was the technological innovation, probably an adaptation from an earlier form used in irrigation agriculture (taro), that enabled the Hawaiians to progress from tide-dependent fishtraps to artificial fishponds which could be controlled at all times of the tide. Ponds varied in form, construction, methods of operation, and in the species of fish raised. Ponds or loko, were divided into two major categories: shore and inland ponds. Huilua Fishpond at Kahana Valley in Koʻolauloa on the Island of Oʻahu has been traditionally classified as a loko kuapa pond. It was a working fishpond (with modifications) until the late-1960s. coastal Oahu and one of the few ancient Hawaiian fishponds that were still operational well into this century. It is also one of only ten ponds left in the Hawaiian Islands which have not been denuded of their archeological sites during the course of historic coastal development. A large majority of ponds throughout the Islands have also been destroyed by natural agencies such as tsunamis (tidal waves) and sea storms. Huilua is a shallow, brackish water enclosure of approximately 4 ½-acres that is roughly shaped as a right triangle with the right angle of the base forming the northwest or seaward corner of the pond. The base or western wall abuts and partially deflects the effluent from the Kahana estuary as it discharges into Kahana Bay. This wall, approximately 500 feet in length. At the extreme south end of the western wall are located two parallel mākāhā or sluice gates. The makai gate is longer by approximately 10 feet than the mauka gates. Huilua Pond has been an important element in the long-term habitation of Kahana Valley and is expressive of that habitation. It was an important part of the valley’s cooperative subsistence economy from the late 19th Century until the late-1960s. At that latter time, the konohiki fishing rights for Kahana Bay were condemned and acquired by the State of Hawaiʻʻi to allow public access to the bay. Huilua Pond became a part of Kahana Valley Cultural Park, a ‘living park’ concept developed by the Hawaii Department of Lands and Natural Resources whereby approximately 150 persons, many of whom grew up there, reside in the Park. The ancient Hawaiians believed that walled fishponds of the loko kuapa type were inhabited by moʻo (water spirits) who were also akua (gods) and kiaʻi (guardians) and relied upon them to protect the ponds in order to assure an abundance of fish. Ritual pollution included the violation of kapu (taboos, i.e., women could not fish nor be involved in the work of the pond), neglect of ritual obligations associated with the pond, poaching, and so on. When the moʻo leaves the pond and then later returns ‘there are always dried leaves floating on the top of the water to indicate its presence’. Oral history informants from Kahana Valley also related that their elders and grandparents propitiated the traditional fish god Kuʻula, otherwise the fish might disappear from the pond. 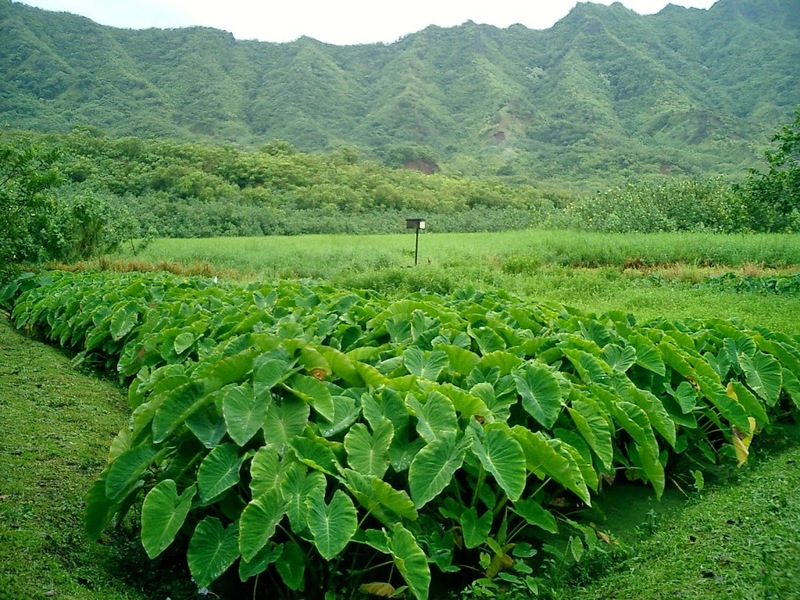 Kahana (Lit., the work, cutting or turning point;) approximately 5,250-acres, is one of the 32 ahupua‘a that make up the moku of Koʻolauloa on the windward and north shore side of the island. It extends from the top of the Koʻolau mountain (at approximate the 2,700-foot elevation) down to the ocean. The ahupuaʻa of Kahana, like all land in Hawai`i prior to the Great Māhele of 1848, belonged to the King. It is estimated that a population of 600 – 1,000 people lived here at the time of the arrival of Captain Cook (1778,) and about 200 at the time of the Māhele. Ane Keohokālole, mother of King Kalākaua and Queen Liliʻuokalani received the bulk of the ahupuaʻa of Kahana at the Māhele; several kuleana awards to makaʻāinana (commoners) were scattered in the valley, as well as land for a school and roads. Keohokālole received 5,050-acres, and the kuleana awards totaled less than 200-acres (the kuleana lands included the house lots and taro loʻi of the makaʻāinana.) The remainder of the ahupuaʻa included undeveloped uplands. Here, each shareholder had his or her own house lot and taro loʻi, but all had an undivided interest in the pasture and uplands, and in the freshwater rights, ocean fishing rights and Huilua fishpond. Then, Mary Foster (daughter of James Robinson and wife of Thomas Foster – an initial organizer of the Inter-Island Steam Navigation Company, that later became Hawaiian Airlines) became involved in purchasing interests in land in Kahana. This was the beginning a “bitter economic and legal struggle” with Kāneʻohe Ranch for control of the valley. An out of court settlement was reached in 1901 in which Mary Foster bought out the Ranch’s interest, giving her a controlling interest in Kahana. With added acquisitions, by 1920, she eventually owned 97% of the valley. Mrs. Foster died in 1930, and Kahana passed to her estate and was held in trust for her heirs. When World War II broke out, the military moved the Japanese families out, and in 1942 the US Army Corps of Engineers erected a jungle warfare training center in the valley. In 1955, the Robinson Agency, acting as the agent for the Foster Estate, contracted with a planner for feasibility studies on Kahana. The report recommended making an authentic South Sea island resort village – an inn with 20 rooms, creating a small lake in the valley, and a nine-hole golf course. Nothing happened as a result of this plan. A study on usage of the valley as a public park was done, but no action was taken. Also in 1962, a private foundation presented a plan to create a scientific botanical garden. A 1987 law authorized DLNR to issue long term residential leases to individuals who had been living on the lands and provided authorization for a residential subdivision in Kahana Valley. In 1993, the Department entered into 65 year leases covering 31 residential properties – in lieu of rent payments, the lessees are required to contribute at least twenty-five hours of service each month. A later law (2008) created the Living Park Planning Council, placed within the DLNR for administrative purposes. The purpose of the Council was to create a master plan and advise the Department of matters pertaining to the park. The image shows some of the kalo I saw in 2003, while inspecting Kahana while I was at DLNR. In addition, I have added other images in a folder of like name in the Photos section on my Facebook and Google+ pages. Ka-uhi-‘īmaka-o-ka-lani (‘the observant cover of the heavens’) was a demigod who had come to Hawaiʻi from (Kahiki) Tahiti with the fire goddess Pele and her followers. 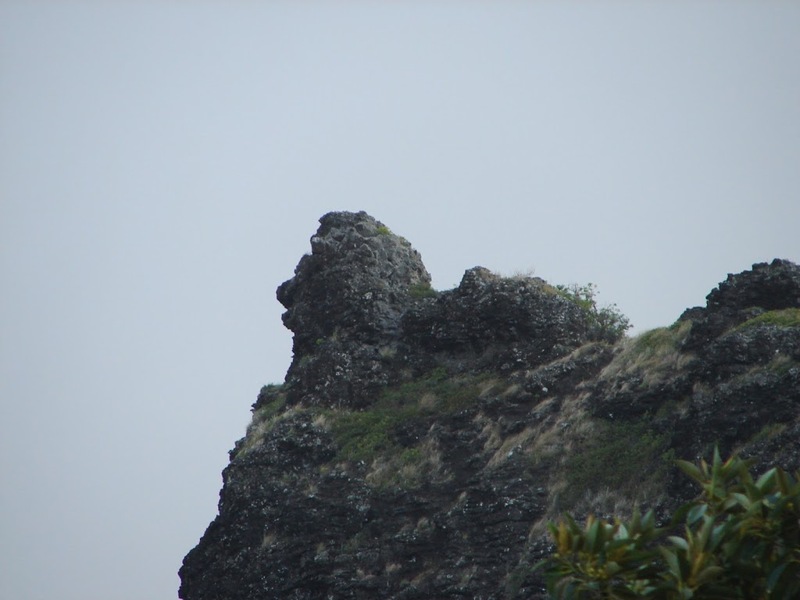 When the followers made their home at Kahana, Ka-uhi-‘īmaka-o-ka-lani was sent to the ridge as a watchman to protect the valley – he was turned to stone. While Hi‘iaka the goddess (Pele’s younger sister) was returning to meet with Pele, as she approached Kualoa, she came upon a mo‘o (dragon) who tried to stop her. He wished to go with Hi‘iaka. He asked her to free him and when she refused, the tried to tear himself loose and rose to a crouching position. Just below the rock formation is the former home of George F. Larsen, a Honolulu contractor who emigrated from Norway; the main structure was a family residence in the mid-1920s. George and Agnes had six children. George Jr. became the first Chief of Police on Maui in 1939. Stanley rose to the ranks of 3 star general after attending West Point; he fought in the Pacific during World War II. Young Agnes was well known in the 1930s and 1940s as a ceramicist and sculptor. The house was at first to be their weekend retreat. Later, they lived there full time and the kids commuted over the Pali to Punahou each day. Mr. and Mrs. Larsen slept upstairs in a bedroom, while everyone else used the Hawaiian style hikie‘e (a large couch – literally translates to ‘upon your bed’) placed around the great room below. The construction had 12-by-12 timbers, used for the exterior and interior – the massive logs used in the framework were floated to Kahana Bay (‘cutting or turning point’) – the practice of putting the logs in salt water was used to help discourage termite infestation. In 1937, the home was sold and in the 1940s it became a Roadside Inn. In 1952, the landmark property in Ka‘a‘awa (‘the wrasse fish’) opened as a restaurant by John Lind (father to Ka‘a‘awa resident, Ian Lind,) back in 1952. John Lind was in the hotel and restaurant supply business and saw the building and site as a great round-the-island stopover restaurant. It changed hands after that. Like many others, while traveling along the Koʻolauloa coast, we often stopped at the Crouching Lion Inn for a meal – and always paused or looked out the window every time we passed “Crouching Lion” (Ka-uhi-‘īmaka-o-ka-lani) as we drove by. The image shows Ka-uhi-‘īmaka-o-ka-lani. In addition, I have included other images of the geologic feature and the adjoining facility in a folder of like name in the Photos section on my Facebook and Google+ pages.